A Cheap Ipod / MP3 Lead, A MP3 Player, We're Rockin'! As I was checking out the electrical department in our local Asda I came across some clearance ipod leads - they had the type that plugs into your mp3 players ear piece jack and end in line-outs for audio and video, perfect for connecting to your TV or home stereo. My old Separates System has been languishing in a cupboard for the last ten years - its a great system, with Phillips Cd, Yamaha tape, Kenwood 3020 amp and Mission 761 speakers, but I just haven't had the space to use it, plus the cd player can't read cd-rw discs, so it has been neglected, just gathering dust. My wife had been pestering me to either get rid of it (never!) or put it in the loft, which I wasn't too keen on either. When I saw these cheap AV leads (£2!) I thought wicked; I can attach my cheap mp3 player to my amp and get it blasting out again! 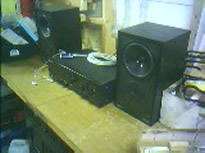 So the Cd, tape and radio when in the loft, but my trusty Kenwood 3020 amp and Mission speakers were transferred to the Garage. Plugging the leads in the auxiliary input on the back of the amplifier, then my mp3 player into the leads, we were ready to rock the neighborhood. I'd forgotten what a great combination the Kenwood Amp and Mission speakers were. It's not the loudest system in the world, but the bass kicks hard and the clarity of the treble is good too. Metallica, Springsteen and U2 hadn't sounded this good in years, and I was very pleased, putting my air guitar to good use for the rest of the afternoon! So if you have an old home stereo lying around, do not bin or sell it, get an auxiliary in lead and fix it your mp3 player, load up some classic tracks and discover your passion for music all over again!